Buried at the bottom of a model motion circulated by the right-wing Labour First is a call to ban any changes to the Party’s selection process until after the General Election. This would mean that no rule change could be submitted to conference until 2021 and would not be debated until 2022. This is the constitutional equivalent of sticking your fingers in your ears, shouting “I can’t hear you” for the next seven years. I happen to think that the current trigger ballot system works reasonably well. It allows constituencies to hold their MP to account and speeds up the re-selection process allowing constituencies longer to campaign for the reelection of their MP, thereby increasing the chances returning them to parliament. However, I am not omniscient and I must concede that there might possibly be a better way of re-selecting sitting MPs that I haven’t thought of. To rule out, apriori, any discussion of the selection process within the next seven years is supremely arrogant and undemocratic. It denies party members the right to argue for a change in the process and worse still it denies everybody in the party the opportunity to hear that argument. Labour First’s reason for wanting to ban debate until 2022 is that the far-left have begun to take over the party, as evidenced by the televised appearances of Simon Hardy (Left Unity) and Nancy Taaffe (Socialist Party) who called for the deselection of MPs in a party of which they’re not even members. So powerful are these dangerous entryists that they managed to secure a whopping 300 votes in the last General Election. In reality the danger of a Trotskyite takeover of the Labour Party is so fanciful that Labour First are starting to resemble a tinfoil hat wearing Alex Jones; shouting about FEMA camps and Obama’s birth certificate. TUSC, for example, is an organisation that has been beaten by the Elvis Loves Pets party anywhere the two parties have contested a seat. In Meadway Council, for example, TUSC received exactly zero votes. Yet Labour First would have us believe that these people will soon be packing out conference in order to force through a mandatory open selection process. Worse still, in the concluding paragraph of the Labour First motion we are told that the party should not be “distracted by internal dispute or concern about future rule changes.” Labour First are very fond of calling debate and rule changes a “distraction.” They even produced a bulletin for the last Labour Party conference in Brighton with the headline “Say no to rule fixes, unite and fight the tories” as if debate and campaigning as somehow mutually exclusive activities. This is a motion written by the same Labour First that submitted a rule change last year which would have seen the size of the constituency section of the National Executive Committee increased to eleven members electing using a byzantine, rotating gender balance system. For all their handwringing about division and distraction the Labour First are more than happy to “distract” the party with rule changes, so long as they are written by Labour First. Debate about party policy and about the constitution are not distractions, they are integral components of an active, politically healthy party. They help to give members ownership over the party they spend their free time campaigning for and should be dismissed at our peril. 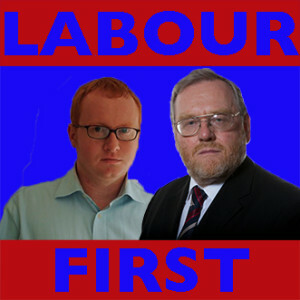 Patrick is spot on,as befits a CLPD member.Labour First are hard right and can be traced back to Frank Chapple,who Johnny Spellar used to bag carry for.What FC did as soon as he got control of the ETU was change the rules of the Union, so that he could destroy all opposition.The Blairites tried to do exactly the same,They hollowed out the Party and had the ftos cheating,even to the extent of breaking into ballot boxes.There was no gutter into which they would not sink.Lab.First are petrified that the Left might restore some grassroots democracy,which would weaken the right/Blairites even more,since they are very weak at the grassroots(viz the pathetic 4.5%).They have only been successful when they have had the cheating ftos backing them up.But,of course,they do not see it as cheating.As Luke A has said,it is the job of ftos to give the Left ”a kicking”.CLPD has been leading the fight for Party democracy for some 40 years.We don’t intend to slacken off. PS.The photos of Luke and John are a bit too flattering! The Blairites offer nothing that isn’t already being proposed by the Tories. Their electoral appeal is plummeting (losing in 2010, 2015 and Jim Murphy’s humiliation in Scotland). They only way they can retain influence is via stitch-up and chicanery. Are you seriously suggesting Corbyn isn’t legitimate because he didn’t get 50.1% of the vote ? If so, then no leader that had contested an election has ever been “legitimate” – Blair included. You talk a lot of tosh Willsman as usual. Talk of hard left and hard right is as divisive as the attempted entryists. It’s about time you and your mates started campaigning for a Labour victory instead of name calling. Whatever else Blair did, he won 3 general elections and all you want to do is slag him off. Well, given that the PLP are dominated by centre right 4.5%ers and their esteemed company, this does not come as any great surprise. It’s amazing that a tendency who rammed through the very process that allowed JC to get elected in the teeth of left (and left moderate!) opinion was not deemed a “[distraction] by internal dispute or concern about future rule changes” in the run up to the last election. Miliband instigated the Falkirk non-crisis precisely because of its proximity to the general election. Labour’s elite relied on an unwillingness to rock the boat at critical time in order to achieve the subsequent rule changes. The Left will have to toughen -up. If Blairites want to play hard ball then throw it right back at them – twice as hard. Miliband gave the Tory media all the meat they wanted. The current system was built on bourgeois social democrats visiting people/ringing round and horrible wheeling and dealing to win suport. When what we need is a system built on honesty and judged on ideas. I want Left Wing Democratic socialists to be able to vote for Left Wing democratic socialist candidates. Boundary changes may actually open the system up a bit. If a Labour MP has a brilliant track record in fighting for the oppressed then there should be little interest in him or her being challenged. But just think of the arrogance of Labours 166 ‘great men and women of history’ who voted to bomb Syria (against the wishes of 75% of members). But those who only want crumbs for the working class/working people should be challenged by those who want to genuinely empower citizens and to challenge the global power of the rich and powerful. Also wherever there is no Labour MP anyone who would like to stand should be able to register with the CLP to stand say 2 or 3 years before the election for free and include a manifesto (and we should encourage local people to stand). Then a constituency can whittle it down to 5 or 6 which should have some diversity and have at least 2 working class candidates (hopefuly socialists) and hopefully the best Left Wing democratic socialist will win, by ideas and not by lobbying etc. Against us are the plotters and manipulators who are devoid of ideas; let our ideas win but we too need to be organised. We need our model resolutions to stimulate debate and unlike the Right who want to shut it down! Solidarity! Oops 66 – been a hard day! Who is this Dickmith?I went to the Oldham by election,did Dickmith?Blair didn’t win 3 elections,the Labour Party did.What else do you call the disciples of Chapple if not hard right?Yours in comradeship,PW. I’m losing track: we now have Labour First, Compass, Progress, Blue Labour, Open Labour, CLPD, Fabians, LRC, Grassroots Alliance…to name just 9! And not to mention Momentum, who are sort of Labour and sort of the SWP/SP/CP. Confused? Talking to ourselves whilst ignoring everyone else is not really a great strategy, methinks…a suggestion to Patrick Smith: forget Labour First, and focus on convincing the 31 million voters who didn’t vote for us in 2015! 50% of those who voted choseTory or UkIP, and according to the last poll I saw, if there were an election tomorrow, 57% would vote Tory or UKIP. So why are we still discussing this issue? There are a whole series of crucial issues on which the Labour left is all over the place, or on which there is no developed position, such the EU, the economy, education, regional development, the integrity of the UK, immigration and much else besides. There is also virtually no discussion on what our medium term and long term objectives should be. And yet we continuously return to the issue of re-selection of MPs even when it is admitted that we already have a workable solution. This debate has all the hallmarks of the religious zealotry: a dogmatic aim is relentlessly pursued even when it has been shown to have little bearing on the reality to which it ostensibly refers. The Trigger ballot system has major weaknesses.eg many TUs have a policy of always supporting the status quo,sometimes voting from their HQ without even consulting their local members.eg see the Peterborough case and the Lothian case where the vast majority of local members wanted a reselection but the system,thanks to the TUs voting for the status quo from HQs, denied the democratic will of the members.